Its where the zones connect across the 3 realms. There were a ton of nuetral mobs there and a few aggro ones, Deep Wolves, purple at 50 were aggro. The highest non boss mobs seem to be sidhe magickers and other sidhe. Very tough to kill with even 2 full groups. Then there are the 3 summoners, we tried to kill one and it was not even close. Approaching Legion difficulty there, they summon tons of purple con bows and cast spells, mez and everything else. In reality they are about as hard as Prince but the summoning and spells make them much harder battles, bring 3 to 4 groups at least. About the nastiest caster mob I've ever seen. 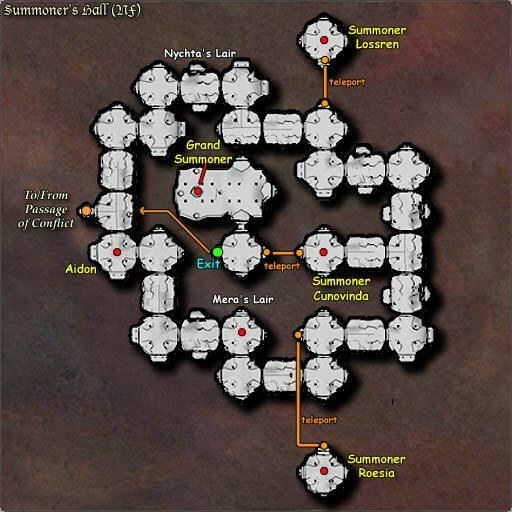 Beyond that in what in DF is Legions room is The Grand Summoner. We didn't even try. I expect he is harder than Legion. how do u get there? The MOBs in here are on Lords of the Undead Faction. If you attack them you will quickly go from Neutral to Aggressive. This means you will have to fight your way to the Summoners instead of walking past the entry MOBs. Where can i enter this dungeon from Midgard? ?